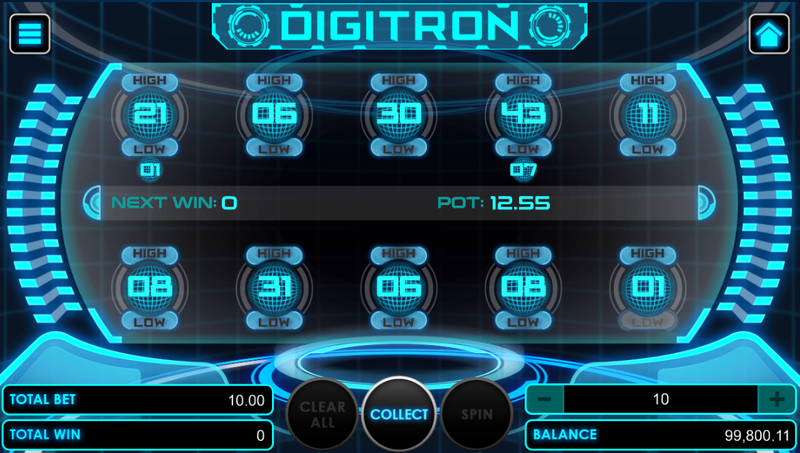 How do I place a bet in Digitron? 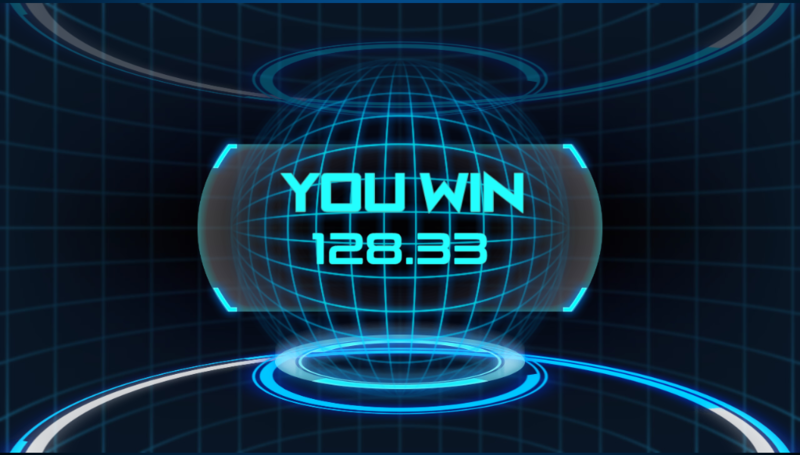 The objective of the game is to predict correctly whether the next generated numbers will have a higher or lower value than the current number. Over a long period of time, the game is likely to average a return to the player of 98.30% of the total bets made. To start playing, the player can choose on how much stake he/she will bet. Clicking the + sign will increase the player’s bet, and clicking the – sign will decrease the player’s bet. 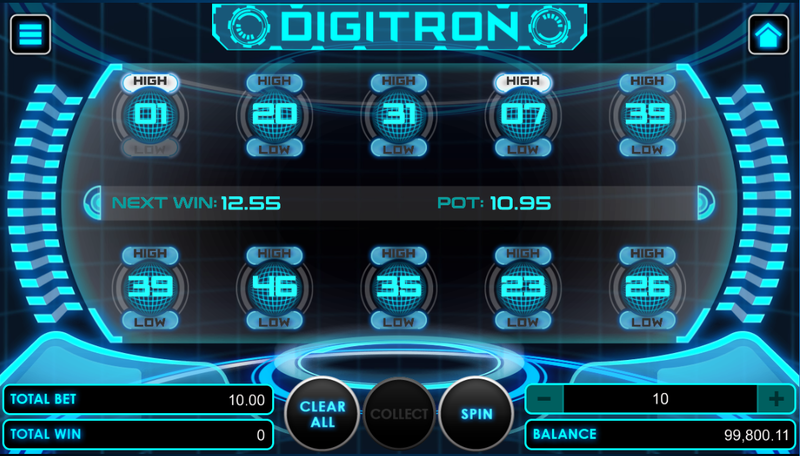 The total bet along with the total win is located on the left side of the user interface. The next win and pot will be located on the center of the UI and will be shown after every pre-round. Clicking Deal will spin the numbers inside the game. The game has 10 boxes to play and out of these boxes, the player can only choose a maximum of 5 (five) boxes and a minimum of 1 (one) box to play. To remove the betting options that have been placed before, player can click again on the selected betting option; if High is being selected, player can deselect it by clicking it again, and if Low is being selected, deselect it by clicking it again. Player can click Clear All to remove the entire player’s bet on the table. Upon choosing the boxes, player has to select whether the number will have a higher or lower value than the current number. Player can click High if the next generated number will be a higher number and click Low if the next generated number will be a lower number then click Spin to generate the next random generated numbers. The player has to guess correctly all the selected betting option(s) in order to win pre-round. Player loses if one of the betting option(s) he predicted is incorrect and Player also loses if the same number is generated on that round. Player can collect his/her winnings pot on table by clicking Collect button and the round will be concluded after the player collects the pot. A winning flier will be shown to reveal the total winnings of the player. In the case where a player encounters network connection issue or any other issue that halt the gameplay after "DEAL" button has been clicked, system will wait for 24 hours for player to resume the game otherwise the system will automatically conclude the game. 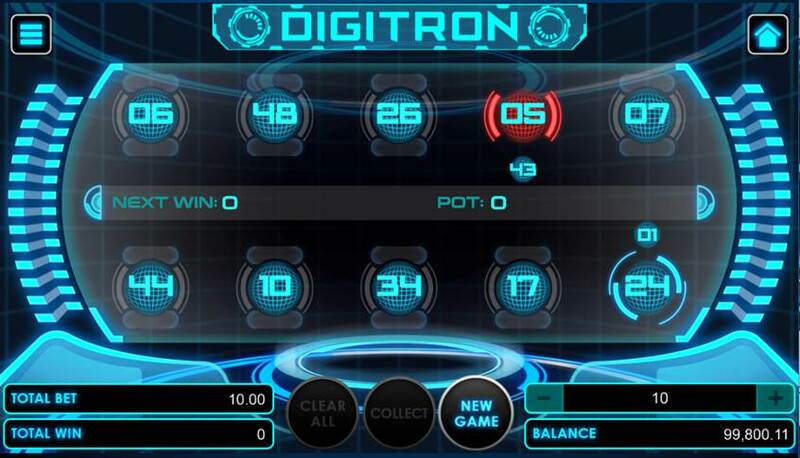 Digitron uses a unique betting system. 10, 20, 50, 100, 200, and 500. The chosen stake will be the stake amount that the player place on the corresponding round. Unless the player chooses to change the stake value, the amount of the total bet will consider the current stake that the player has chosen. Player can raise the stake by clicking on the right button (+) or reduce by clicking the left button (-). Home button – to close the current game and go back to the Games’ lobby. 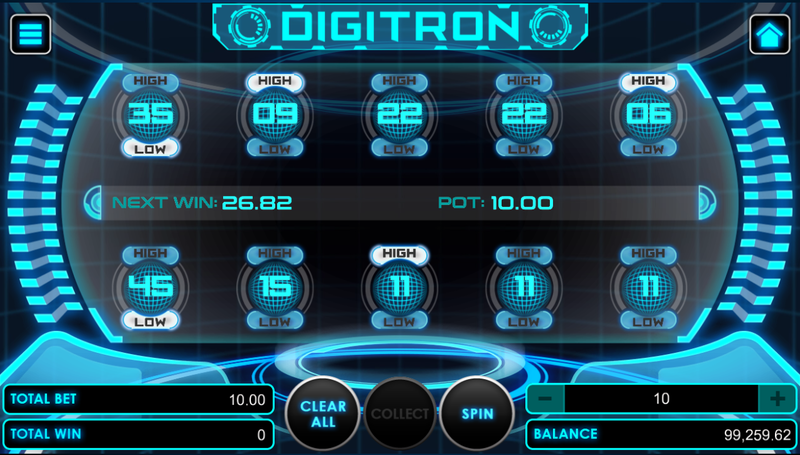 Next Win and Pot Information – displays the next win and pot information of the round. Next Win is the amount that the player can win if he wins on the current round. Pot’s Amount is the current stake amount on a pre-round. Pot will increase once the player wins on a pre-round. It is the amount that the player can collect if he wins a pre-round. Generated numbers and betting option – the place where the generated numbers and the betting options are displayed. The generated numbers are range from 01 to 50. The player can choose to bet High or Low based on these numbers. High will be activated when the generated number is from 01 to 49. Low will be activated when the generated number is from 02 to 50. Total Bet and Total win information – displays the total bet and total information of the game. 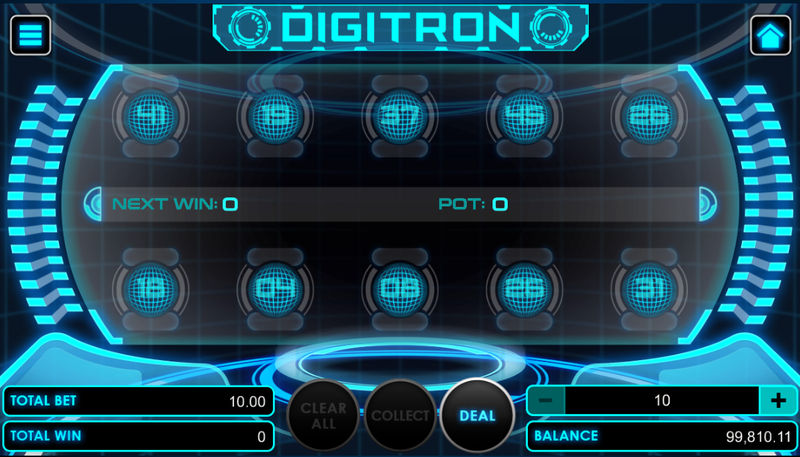 Gaming controls – consists of the controls used in the game like Clear All, Collect and Deal. Spin will appear after the player has selected his betting options replacing Deal. New Game will appear if the player loses the round replacing Deal. Clear All – clicking “Clear All” will clear all the betting option(s) that the player placed. Collect – clicking Collect will collect the pot of the round. Deal – clicking Deal will start the round. New Game – will start a new round with betting options placed. 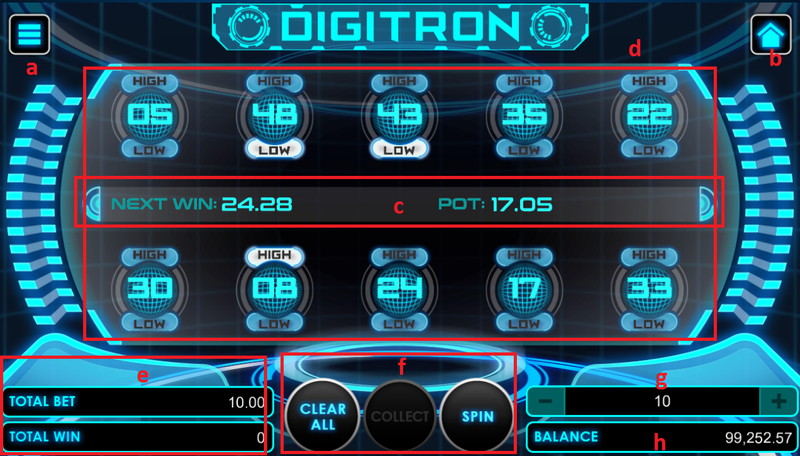 The Digitron game has two betting options: Low and High. The numbers 01 to 50 has its respective betting payout per betting option.